Inauguration of the Grand Kerala Shopping Festival GKSF Season 8 will be held on 1st Dec, 2014 at Kottayam Nehru Park at 6PM . Hon'ble Chief Minister will be inaugurating the event. Hon'ble Ministers of Tourism, Finance, Industries, Forest and Panchayats & Social Justice, Sri.P.C.George and other eminent personalities will grace the occasion. Starting today, the eighth edition of Grand Kerala Shopping Festival (GKSF), the largest shopping carnival of Kerala will end in January 2015. GKSF organized by the government of Kerala in association with Department of Tourism, offers a 100% VAT refund to tourists from outside the state who visit and shop in Kerala during season 8. 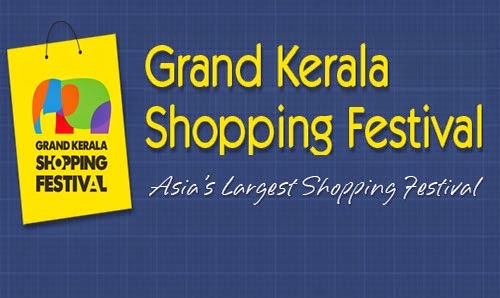 The previous successful editions of GKSF had helped to highlight Kerala as a shopping destination in India. The organizers are well set to begin the Season 8 as one of the biggest ever Shopping Extravaganza, with novel initiatives and exciting prizes to the shops, shoppers and customers. Besides glitzy prizes an array of entertainment is also planned.